An American Airlines flight to China was diverted twice, first because of a medical emergency with a passenger on board, and second because of a mechanical issue involving the plane, according to reports. American Airlines Flight 263 took off from Dallas Fort-Worth Airport on Thursday at 11:07 a.m. en route to Beijing. First the flight was diverted to Edmonton because a passenger had a medical emergency. 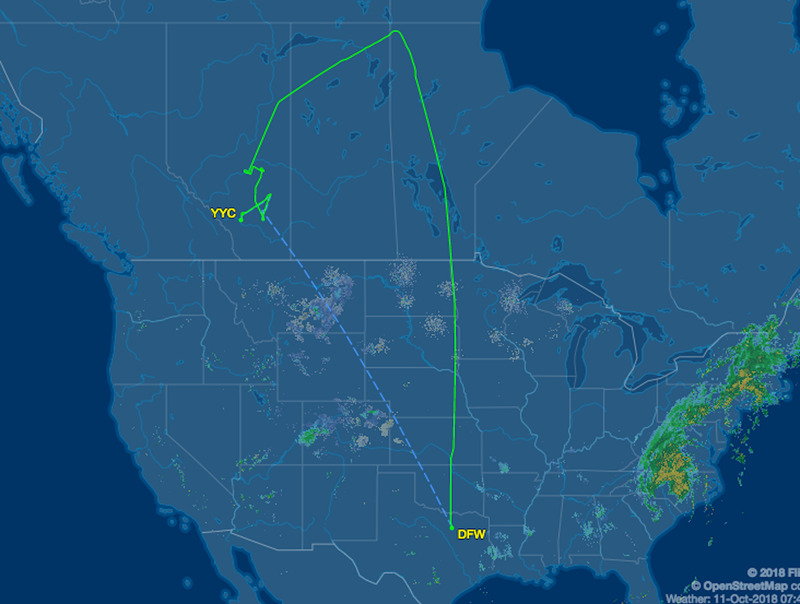 According to Tom Podolec, a senior journalist for CTV News and an aviation photographer, Flight 263 declared a mayday emergency for flap failure, canceled their approach to Edmonton, and requested emergency crews as precaution. American Airlines Flight 263 took off from Dallas Fort-Worth Airport on Thursday at 11:07 a.m. en route to Beijing Capital International Airport in China, according to data from Flight Aware. But the plane made two unexpected diversions. First the flight was diverted to Edmonton because a passenger had a medical emergency. In a statement to Business Insider, American Airlines spokesperson Ross Feinstein said, “The passenger was evaluated by medical personal,” noting only first responders could provide “any additional details,” on the passenger’s medical condition. But prior to its planned landing in Edmonton, Flight 263 then experienced a second emergency, this time a mechanical issue with the plane. According to Tom Podolec, a senior journalist for CTV News and an aviation photographer, Flight 263 declared a mayday emergency for flap failure, canceled their approach to Edmonton, and requested emergency crews as precaution. Podolec later noted the plane diverted to Calgary International Airport to conduct the emergency landing. FlightAwareA screenshot of the route taken by AA263 as it flew from Dallas to Edmonton to Calgary on Thursday, October 11. According to The Dallas News, passenger Gurmeet Singh said crew members originally said they’d be landing in Edmonton but switched to Calgary for a longer runway. Podolec reportedCalgary’s runway is roughly 3,000 feet longer than Edmonton’s. Heavy.com reported the plane started dumping fuel to reduce landing weight in preparation for its touchdown in Calgary. Flight 263 was a Boeing 787 twin-jet Dreamliner, and as an international flight, it had a large amount of fuel in its tank. The flight finally landed in Calgary at approximately 4:56 p.m. on Thursday afternoon, after six hours and 49 minutes in the air. Business Insider reached out to the Calgary International Airport to confirm the medical condition of the passenger who was attended to by first responders on Flight 263, but did not hear back for comment. Podolec provided a video of Flight 263 touching down in Calgary on social media.